July was pretty busy month for us on Lending Club as we purchased a total of $875.00 worth of notes this month. 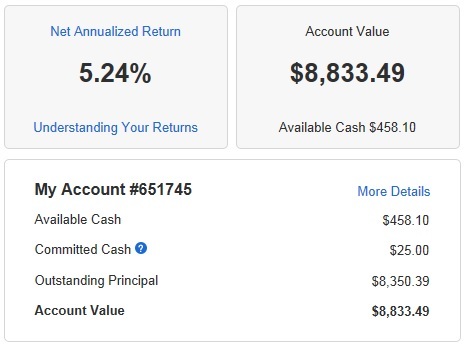 At the end of July, our Lending Club account balance was at $8,542.25. We received $517.75 in payments from our active notes in July; of which, we received, $53.94 in interest (an increase of $3.20/mo.). The principal balance of our active notes was $8166.62 (an increase of $1,064 from June total), with $150.00 of loans in review or funding and a remaining cash balance of $225.63. We are currently generating 5.21% on our seasoned notes. No loans were charged off this month. Although our Lending Club account was pretty active, the month July was a bit lower for us on Prosper as we purchased a total of only $375.00 worth of notes this month. Considering that we received $460.35 in payments, this meant we didn't even re-invest all of the monies we received this past month. Hopefully, August offers more opportunities for quality notes as we simply didn't find as many that fit our criteria this past month. At the end of July, our Prosper account balance was at $8,587.15 (an increase of $224.23 from our balance at the end of June). We received $460.35 in payments from our active notes in July; of which, we received, $62.06 in interest (an increase of $4.96/mo.). The principal balance of our active notes was $7,846.96 (an decrease of $0.23 from June total), with $155.00 of loans in review or funding and a remaining cash balance of $449.40. We are currently generating 7.55% on our seasoned notes. In an effort to grow both P2P accounts, we are currently re-investing all of the payments that we receive from our notes. And when the cash balance is low, we are continuing to add more funds to the account so that we may constantly purchase new notes. Monthly payment will be less than $250. Their occupation (certain occupations, known to be more secured, are more desirable). Debt to income level, etc. We do not invest in any notes where borrow is currently delinquent, of if they have had a public record within the last 12 months. We also do not invest in notes where the description provided is "Other." We feel that there is too much risk involve when the borrower is not willing to reveal why he/she needs the money. Looks good! I like your slow and steady consistency and risk level with P2P Lending. One thing I'd add is that your Lending Club NAR is not actually a seasoned return, whereas the Prosper's 7.55% is in fact seasoned. Seasoned notes are any notes older than 10 months of age (according to Prosper). Thank you for the kind words and for the clarification. I didn't know the difference. Regardless, very happy with the returns so far. W2R: So Prosper only gives you your return for nots 10 months or older and ignores new ones? They give you both. They provide an 'All Notes' Return as well as a 'Seasoned Notes' return as defined above. Certainly can give a quick snapshot into how "aged" notes are performing. You have some good capital in play between your LC and Prosper accounts. Have you had many defaults with you A and B loans? I found my B loans to have higher default rates then the Lending Club "benchmark". 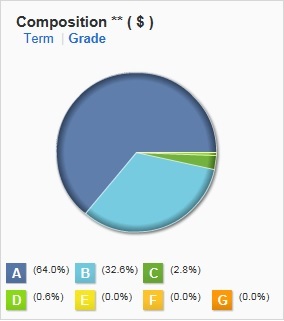 I now exclusively invest in grades D and greater. AA - Between A and B loans, I've had more defaults with B loans. But overall, the defaults tend to correlate with the investment grade. Great job on the p2p lending. the 700+ credit score is crucial to getting paid. And the people having a job. NNL - Thank you. I try to do my best to find quality notes that pay a reasonable return. A 700+ credit score and a job is definitely important. I am also jealous that I can not invest in P2P lending because of state regulations. I am not sure if this will be available to the rest of the country if they can get all the states to participate; I think LC and Prosper would be making out very well. Why get a personal loan from a bank at 12% interest when you can get it for 7% on Lending club. This whole P2P lending thing is going to explode and I can't wait to invest in it. Not sure why it is not available in all states but hopefully those states that are currently excluded are eventually added soon. This is one great way to allow the little guy to invest and compete against big banks. Also a great way to keep banks honest and help keep rates competitive since their ability to raise rates would be limited given that there would be other options available like P2P. I also live in a state that does not allow me to invest directly in P2P Lending. I am able to use the secondary market (FolioFN) however to invest in Lending Club where I am. Not sure if maybe you could do the same. Frugal... So you look at employment length and income as part of your strat? I might have to think on that thats not a bad idea. Are you funding loans or buying notes in the secondary? I've found the secondary market to be getting short on notes in the past couple months. ISP - I try to evaluate as much as I can to ensure my risk to reward is acceptable. I was nominated AGAIN for a Liebster Award! !